Design-Build construction has become so widely accepted that owners and their advisors must seriously consider this approach when making decisions about project delivery. With its opportunities for cost containment and substantial risk transfer, Design-Build is increasingly becoming the delivery method of choice for owners with challenging funding limitations. But deciding to use the Design-Build system for underground projects is one thing; successfully implementing it is quite another. 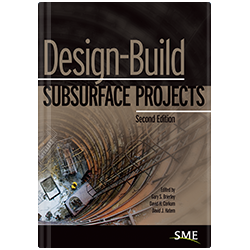 Design-Build Subsurface Projects, Second Edition, can help bridge that gap. First published in 2002, this cutting-edge book provides a straightforward, comprehensive look at how to make Design-Build work on complicated projects involving tunnels, highways, dams, and deep foundations. The authors are a "who's who" of subsurface construction experts, many of whom are key players in the most high-profile and challenging projects in the world. Drawing upon their wealth of practical experience, they spell out a list of common sense best practices that can be used by today's project owners and designers. Be advised: these authors don't shy away from the many thorny issues of Design-Build. Nor are they unabashed cheerleaders. They dispassionately explore both the advantages and disadvantages of this system, which must be carefully weighed and evaluated so planners can decide what is best for their projects based on all the important variables, including third-party impacts and environmental/community concerns. You'll find extensive information about procurement, as well as risk allocation issues, which are significantly different from the Design-Bid-Build approach. Team structure, agreements, design development, subsurface exploration, geotechnical reports, construction phase issues, and insurance are also examined in great detail.